The “Tea Party” is destroying the Republicans! BUFFALO, New York (Reuters) – Democrat Kathy Hochul drew on voter discontent over Republican plans to revamp Medicare to score an upset win on Tuesday in a special election to represent a conservative upstate New York congressional district. Hochul defeated Republican Jane Corwin in a three-way race that also included self-described Tea Party candidate Jack Davis. The outcome did not affect Republican control of the House of Representatives. “Tonight the voters were willing to look beyond the political labels and vote for a person, and vote for message that they believe in,” Hochul told cheering supporters minutes after taking a phone call from Corwin, a state assemblywoman. Once expected to be a Republican landslide, the special congressional election tightened in the final days, with a spotlight trained on the national debate over the budget deficit, spending and Medicare — the government-run healthcare program for the elderly. Corwin came under heavy attack from Hochul for backing a divisive budget plan put forth by Republicans in the House, and also saw Davis siphon away support. National parties and outside groups poured money into the district, hoping to claim victory in the battle over cuts in spending and Medicare first proposed by House Republican Paul Ryan. “Kathy Hochul’s victory tonight is a tribute to Democrats’ commitment to preserve and strengthen Medicare, create jobs, and grow our economy,” Democratic House leader Nancy Pelosi said in a statement. Only two Democrats since World War Two have represented the heavily Republican 26th Congressional District, which covers a big area of western New York near Buffalo. National Republican Congressional Committee Chairman Pete Sessions said in a statement that Corwin had to battle “two well-funded Democrats, including one masquerading under the Tea Party name.” The Tea Party is a conservative activist movement. In a decisive victory Tuesday, Democrat Kathy Hochul defeated Republican Assemblywoman Jane Corwin, 47 percent to 43 percent, in a heavily GOP congressional district. The House Republican budget plan authored by Rep. Paul Ryan, R-Wis., became a focal point in the election as Corwin defended her support for it and Hochul, the Erie County clerk, played up her opposition to the plan’s unpopular restructuring of Medicare for those 55 and younger. Jack Davis, a wealthy businessman who poured more than $2 million into his campaign, ran as a third party candidate on the Tea Party label and emerged with 9 percent of the vote. He had run as a Democrat in previous attempts at this House seat, and his presence in this special election certainly helped what should have been a slam dunk for Republicans become a competitive contest in the closing weeks of the campaign. After spending the last two years on the defensive over the stimulus, health care and cap and trade, Democrats seem to have found an opening to play some offense using the Ryan budget, specifically its proposal to shift Medicare from a system where the government directly reimburses doctors to one where subsidies are provided to seniors and payments are made through private insurance companies. To give you a sense of this Republican slice of New York: John McCain defeated President Obama in this district, 52 percent to 46 percent, in 2008. And despite Andrew Cuomo’s 63-33 statewide trouncing of Carl Paladino in the governor’s race last year, Paladino won here with more than 60 percent of the vote. Former Rep. Chris Lee won the district with 73 percent of the vote in 2010, just a couple of months before his infamous shirtless photo emerged, which led to his resignation and Tuesday’s special election. Appearantly in New York, candidates can win elections with just a plurality of the vote, rather than an outright majority. It is most likely that Corwin would have won a majority in a runoff election. I wouldn’t be surprized if Republicans in New York try to change the election procedures later. It should be noted that even if Davis was a Democrat years ago, he would have had to run with a lot of conservative positions to be competitive in such a conservative district. MANY Democrats are indeed like that, unfortunately. Therefore, I doubt that Hochul is a Progressive. Pete Sessions’ remarks are an insult to the general political climate in that area. In any case, it is clear that the “Tea Party” has become a laughingstock that is ruining the power and credibility of the Republican Party. The biggest mistake Republicans like Sarah Palin, Michelle Bachmann, and others made was to try to draw these dissenters into the Republican camp. Likewise, the Tea Party leaders should have rejected the Republicans and instead drew millions of people into the membership of the Libertarian Party, which would then overthrow the Republican Party to become the Democrats’ main opposition. Because that didn’t happen, there will be no real change in government over the next decade or so. A great opportunity for long-term reform was destroyed by the desire for short term political convinience. This entry was posted in Conservatism, politics and tagged Democratic, Jane Corwin, Republican, Tea Party movement. Bookmark the permalink. ← Laci Green, your warning is too little, too late! 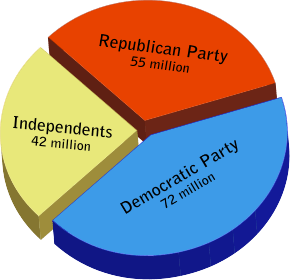 Likewise, the Tea Party leaders should have rejected the Republicans and instead drew millions of people into the membership of the Libertarian Party, which would then overthrow the Republican Party to become the Democrats’ main opposition. I would like to have seen this happen, being a Libertarian (an ex-Republican myself)… And it seemingly began as a movement that did attract Libertarian leaners. Unfortunately, some of the Social Conservatives like Sarah Palin and Christine O’Donnell took claimed “Tea Party” support and took it further to the right than I would like.. I mean, I do consider myself a Conservative of sorts…I’m just not really a “Social Conservative.” I’m more of a Fiscal Conservative. If Sarah Palin were to get the Republican nomination, then I would say Obama will win reelection.. Hell, I may even help him. I’m just glad that Huckabee and Trump have decided not to run. Trump is “trollish” entertaining, but I could not vote for him, and Huckabee is too Socially to the right for me. “Social Conservatives” have always been a disgrace to America. In the early 19th Century, they supported slavery. In the late 19th Century, they opposed women getting the vote. In the early 20th Century, they supported the racist caste system in the South, and in recent years they opposed gay rights. As far as I’m concerned, they are the biggest threat to our own Constitutional rights and shouldn’t even be tolerated in our politics, any more than Nazis or Communists are. I am also a Fiscal Conservative, and see the 14 trillion dollar debt of the United States as outrageous and inexcusible. Ironic that much of that debt was caused by Reagan and Bush Jr, who were Social Conservatives and Economic Conservatives, but not Conservatives where it really would have made perfect sense.